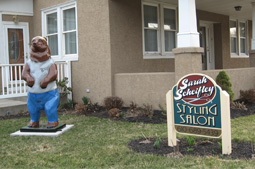 “Bill,” a standing bear sponsored by mother Sara and daughter Tira of the late Bill Scheifley, owner of the former Scheifley’s Tree Service, stands proudly along 562 protecting Scheifley Hair Salon. Bill graduated from Boyertown Senior High School and lived in Boyertown his whole life. He started out working for the Limerick Power Plant and was doing the tree service on the weekend. His business started out small with just tree trimming and removing. As his business grew, he started doing tree work full time. Over the years, the business grew into a great business where he did more then tree work; there was also trucking, land clearing, and tub grinding (making his own mulch) involved. 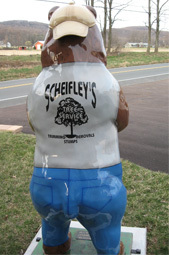 He owned Scheifley's Tree Service for over 20 years. Besides tree work, he loved to ride his motorcycles and also going hunting. he mostly enjoyed outdoors. 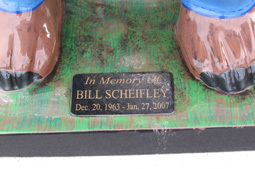 Bill Scheifley had 4 daughters: Tira, Devan, Haley and Autumn. Jeff Graber’s assorted talents have benefited the Bear Fever project in many ways since the very beginning of the project. 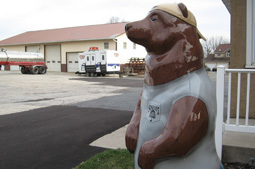 Graber Letterin’ was one of the first businesses to enthusiastically support and sponsor a Bear Fever bear but asked Papa Bear Paul Stahl what Paul wanted on the bear. As a professional graphic designer, Paul was delighted to help design the Bear Fever logo bear and remains one of his favorites. Celebrating Paul’s logo, the school district’s signature colors, and the Bear Fever website generously created and maintained by Media Fusion are just a few of the reasons we love Jeff’s work. 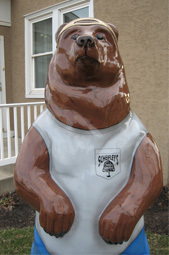 Jeff served as artist for Boyertown High School’s Class of 2009 bear and on the sign he fashioned for Studio B, Boyertown’s art gallery and teaching studio. Following is the original journal entry created by Elise Sherman in 2005 to introduce Jeff Graber and Graber Letterin’ to Bear Fever fans. When my perky English Teacher, Jane Stahl, first shared the idea of Bear Fever with me, I was all-ears and almost simultaneously agreed to take part in it. I must admit that I really had no clue as to what I was getting involved in, but that didn't stop me because I was eager to lend a helping hand in a new and interesting project. At one point, I recall declining my offer of involvement because I was so intimidated and overwhelmed at the amount of work this project seemed to require. Once Mrs. Stahl tenderly encouraged me that I could handle it, I became a girl with one thing on my mind. I had to complete my mission: the mission to track down the undiscovered and irreplaceable Graber Bear. And so began my hunt for this rare bear. One afternoon, despite the gray overcasts and trickling of rain, I was feeling lucky. Acting spontaneously on this feeling, I telephoned Jeff Graber's business, in hopes of catching him before he ventured off. Having no "luck" in reaching him, I decided to just drive up to his Letterin' building and take a look around. Arriving at the business, I literally thought my luck ran away when I read the big square sign on the window with the words "CLOSED" pressed on it. 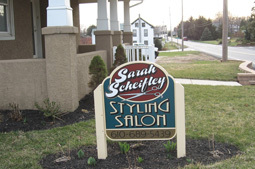 While staring at the sign, which now seemed to be mocking me and my so-called "lucky feeling," my attention was suddenly averted to a young man opening the door adjacent to where I was parked. Thinking this was my only chance, I dashed out of the car and ran up to him and introduced myself. The day was looking brighter as he announced his name, which was, indeed, Mr. Graber himself, live and in person. He proceeded to invite me in and I began to feel guilty. I could tell my unexpected visit had caught him off guard. Nevertheless, he maintained his composure and enthusiastically agreed to answer some questions. After some thought- provoking questions that had put him on-the-spot, I offered to leave the questionnaire with him to ponder and then to send it back to me. The interview had pretty much been completed and now was the time I had been anticipating; the revealing of the bear. As he escorted me into the garage of the building, I was surrounded by an aroma of sawdust and pine trees. A clean smell, it was, yet unfamiliar. I chuckled to myself as I was taking "shots" of the bear and Jeff because he was very concerned about the small stain on his shirt being noticeable in the photos. I reassured him that I would stand far enough away. So, thus ended my first encounter with Mr. Jeff Graber and his incredible bear. Mission complete, except for the fact that I found out little to nothing about Mr. Graber, personally. It wasn't until three days later, when his information got back to me, that I discovered a little more was well worth the wait. If there was one word to describe Jeff Graber, it would be BUSY! When he is not perfecting is graphic art in his full-time business, spending quality time with his girls, or designing elaborate pieces of work for Bear Fever, he somehow still manages to go hunting, watch NASCAR, and keep up with his football. This is one dedicated man in all his endeavors. In Jeff's earlier, he was always skilled in art; and since he had an interest in lettering racing cars, he started a small business that rapidly grew. In 1990, working out of his own basement, he lettered race cars, trucks, and signs. It wasn't until two years later that he established his business as a corporation and moved to present location behind Earl School. Jeff hopes the project is a success and that the people appreciate the time all the artists and sponsors have invested. Mr. Graber is a very talented man and it was my privilege and honor to have adopted his bear. Even though I felt like I got a slow start to the project, the journey, thus far, has been indescribable and rewarding. I can't thank Mrs. Stahl enough for not letting me wimp out from the beginning. I hope and pray that Bear Fever will become contagious and spread like dandelions on your perfectly green grass. This kind of fever we should never want to get rid of.